Homepage. This page: A fun little illustration, drawn on an envelope in December 1902. An aspiring motorist from the veteran era. This curious little piece of memorabilia is definitely a one-off, and features a fun doodle relating to the very earliest days of motoring. 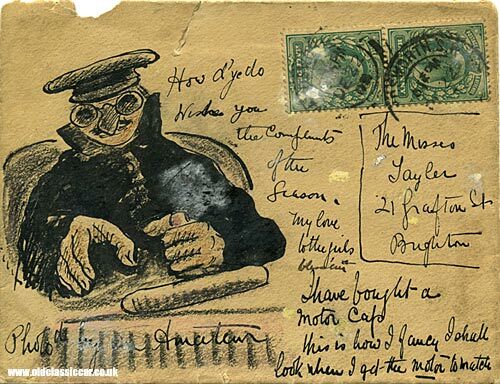 Drawn on the front of an envelope, is a pioneer motorist steering his veteran machine courtesy of a tiller - no steering wheel in sight. The car's chauffeur is kitted out in all the best motoring clothing - not unlike this 1920's clothing featured in the gadgets & accessories section. Note the hat, thick winter driving coat, and goggles. The envelope was franked on 22nd December, 1902 .... some 117 years ago. The envelope was addressed to "The Misses", who lived at 21 Grafton Street in Brighton. The message reads as follows: "How d'you do, wish you the compliments of the season, my love to the girls - bless 'em - Have bought a Motor Cap, this is how I fancy I shall look when I get the motor to match". Below the illustration is a note saying "Photo by an Amateur". I wonder if the sender ever did buy a motor-car? and if so, what make and model it was?